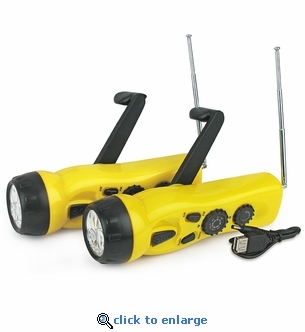 This a set of two 4-n-1 Dynamo Radios with Flashlights & Cell Chargers. This hand crank emergency radio includes a flashlight, siren and a built-in cell phone charger and never needs batteries. Being able to charge your cell phone during a power outage can be a life saver. One minute of cranking provides enough power for up to 90 minutes of flashlight use. Sold 2 per set.